I am in a constant challenge to use my stash. I created this mini album from Prima's Pixie Glen range. Prima's designers create beautiful paper that's easy to work with and provides small graphics to fussy cut for embellishments. I used a Dusty Attic chipboard gate on the cover and attached it with dollhouse hinges. I used a closure that I found in the bead section of a "big box" craft store. I made several pockets and tags to keep the album interactive. The last page has a flip up acetate photo spot so I can place a photo behind the window. I will have a few Christmas mini albums to post later this week so I hope you'll stop by again. Welcome to my first post! I created this using a shadowbox from my stash. I painted it white using Tim Holtz® Distress Crackle Paint in the color Picket Fence. I let the paint dry overnight and used Stickles™ Glitter Glue in the color Crystal to create the sparkle effects on the frame and images. The church graphic came from Little Pink Studio. I enhanced it with the Stickles mentioned above. I popped out the angel in the trees on the top, right side of the church. That angel came from The Vintage Bag Lady. On the outer left side of the shadowbox I glued some angels that came from the Graphics Fairy. The sled and additional trees glued inside the shadowbox on the bottom. Those are from vintage cards I already had in my stash. Welcome and thank you for stopping by. I hope you find something artful to inspire you here. I primarily focus on scrapbooking but love to dabble in other art forms as well. My electic style encompasses a mix of vintage and shabby chic with a little French country. I also occasionally craft in cleaner and more modern styles as well. Feel free to email me at artfulaugments at gmail dot com. The content on this site is protected by copyright laws. All content is for personal use and inspiration only. All photos, names and designs are the property of the original owners. available for download. Content may not be reproduced, sold or used for commercial purposes or submissions without express written permission. 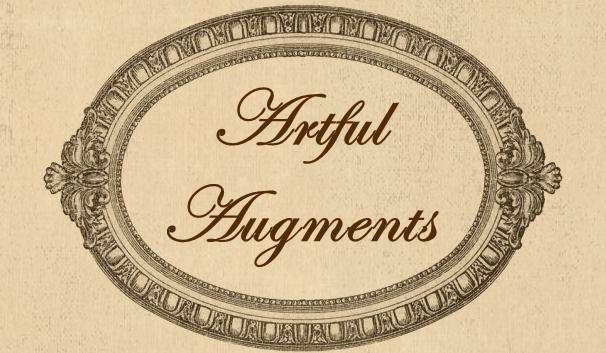 © 2012 Artful Augments. All Rights Reserved. Picture Window theme. Powered by Blogger.